The hot summer is approaching and I, as well as my family, can’t wait to enjoy the summer season. We try to use the sunny afternoons and throw some great outdoor parties. I must say that we have become somewhat famous in our neighborhood for those. Hosting such parties is not a simple task, you need a lot of snacks, fruit and, of course, cold drinks; and nothing cools the drink better than the ice cubes. As I am preparing for a big party that will mark the opening of this summer season, I am trying to organize everything up front so that I can enjoy the party with my friends instead of resolving the problems that occur in the kitchen. Dealing with the ice cubes stuck together or broken is one of the issues that I often faced in the past, and I have decided to be better prepared this year and, instead of buying the ice, make it myself. For this reason, I set on a mission to find the best ice cube trays possible, and I will gladly share my research and experience with you, as always. Why Make Your Ice When You Can Buy It? As I have already mentioned, often when I buy ice by the time I get home and put it in my freezer it melts enough to become wet, and the ice cubes become stuck to each other. Moreover, the ice cubes are often broken or chipped and do not look good in a glass, especially if it is a glass of classy whiskey or bourbon. However, the main reason why I want to make my ice using ice cube trays is that they are easy to use, versatile and you can make your ice fun. For example, for my son’s birthday party I have colored the ice blue using the edible food colors, and since the theme of his birthday party was sea bottom, everyone loved it! Make decorative ice cubes using edible flowers, fruits such as blueberries, cherries or strawberries, or, as I have done for my son’s birthday, add edible food colors or even glitter and make them pop in any drink. If you want the fruits and flowers you add to your cubes to be centered, fill the ice trays halfway up with water, and freeze it; then add whatever you like, add more water, and freeze again. Avoid watering down your drinks - make the ice cubes from the same drink that you are serving your guests or enjoying yourself. For this purpose, you can freeze lemonade, coffee, and any other juice. Make ice in various shapes. The ice trays come in many fun colors and shapes, but they can also create ice cubes that look like stars, hearts, bottles, etc. Store your leftover sauce or soup stock into your ice cube tray, freeze and then defrost when needed. Freeze spices and your favorite herbs such as mint, basil or oregano by mixing water and sliced herbs and freezing them in the ice cube tray. Plastic ice cube trays are the least expensive alternative. Besides being affordable, they are also widely available and come in various fun colors. Most importantly, they do a good job in creating ice cubes, which is, after all, their intended use. On the downside, it can be rather difficult to release the ice, and they easily crack in the process. Besides, the plastic absorbs smells from the freezer and that affects the ice cubes too. All these negative features have an undesirable influence on the overall cost as plastic trays are not durable and you have to buy new trays repeatedly over the years. 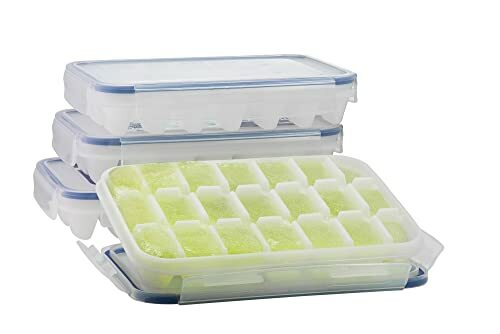 The most serious deficiency of traditional plastic ice trays is that the toxic chemicals such as Dioxin and BPA transfer into the ice you make. How much of it ends up in the ice cubes is uncertain, but these chemicals are harmful and should be avoided. Silicone ice cube trays, as opposed to the plastic ones, are durable. It is quite easy to remove the cubes, but they do share a common issue with the plastic trays as they also absorb smells and flavors which can lead to peculiar smell and taste of the ice. Another similarity is that the silicone trays are also quite affordable, although usually a bit more expensive than plastic. The ice produced in the silicone trays is often smaller, but that fault is soon forgotten when you find out all the interesting shapes of ice cubes you can make using them. The smaller, specialty-shaped cubes often have to be removed one by one which can take some time to do. Metal ice cube trays are most often made from aluminum or stainless steel. The metal trays offer the best durability as they never crack. Moreover, since they will probably last a lifetime, you should not look at the price tag when you buy them. They are expensive, but they pay off in the long run. The greatest positive feature is that metal trays do not release toxic chemicals or odd aftertaste in the ice they form. It is very easy to remove the ice cubes too: simply run cool water over the ice and pull up the lever. Always wash the tray thoroughly even when brand new. If it is a new tray, rinse it in hot water and dry thoroughly with a clean towel. If it is an old one, it is best that you use dish detergent and hot water as that will surely remove any ice or food residue from the freezer. Extra Tip from Barbara: To make sure that your ice is not going to taste and smell bad, use a mixture of 2 teaspoons of baking soda and ½ cup of warm water, pour it into the tray, scrub the compartments, and rinse with warm water. Fill the tray with water making sure that you are pouring the same amount of water into each compartment. In this way, the cubes will all freeze at the same time. Avoid using the tap water, as the ice cubes will appear cloudy and sometimes even taste bad due to the impurities. It is much better to use filtered or bottled water, or you can simply boil the water first. For even better results, you can allow for the water to cool, and then bring it to a boil a second time. Extra Tip from Barbara: Hot water freezes faster – it is a scientifically proven principle known as the Mpemba effect. Make sure to place the tray on a flat surface in the freezer and as far back as you can since the back of the freezer is the coldest. Allow the ice to freeze for approximately six hours. Remove the cubes from the tray when they are frozen and store them in an airtight freezer bag or a plastic container. If you skip this step, the ice might absorb the smells from your freezer. Extra Tip from Barbara: Do not use the ice cubes that are more than a week old as they change the taste and smell in time. Of course, it depends on what you like and need as the choice is almost limitless. There are no best ice cube trays, rather trays for every occasion. There are different fun shapes for every occasion, especially for kids. Smaller ice cubes will melt faster and therefore cool your drink faster. 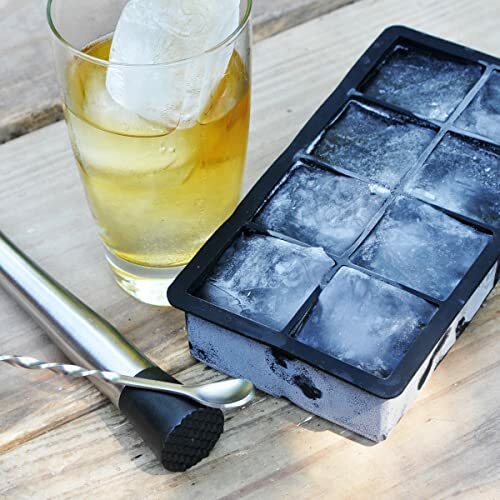 The durability of your ice cube trays mostly depends on the material that is used to make it. I certainly hope that now you can identify the type of the ice cube tray that you need. Next, I present my reviews of the five ice cube trays that I have bought for my party and tested as to identify the best one among them. These are standard, plain looking, white plastic ice cubes trays made in the USA. 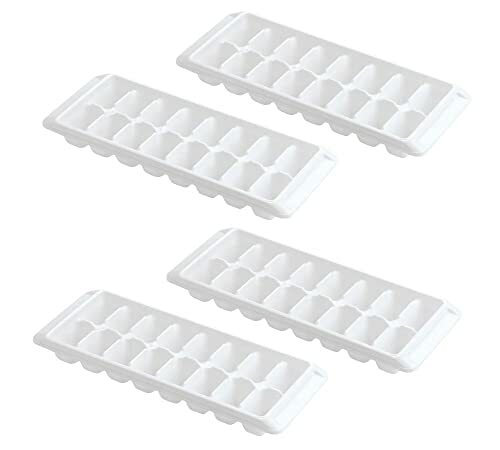 You receive four trays in the package, and each holds sixteen 1 oz ice cubes, so you can make 64 ice cubes at the time, enough for a few friends coming over. The trays are made of High-Density Polyethylene, but I could not find the “BPA-free” sign on them. For this reason, I have visited their website to try and find that information, and I have read that all their products are BPA free, so you should not be concerned about that. I like the fact that they stack and take little space in the freezer, the water spreads evenly, and the ice cubes fall out very easily. As a matter of fact, the plastic is very flexible, and you literally twist the tray a bit, and the cubes slide out. Unfortunately, they do not come with a lid, and the water tends to spill over while you take the full trays to the freezer. As the name already implies, Arctic Chill Large Ice Cube Trays produce ice cubes that are bigger than the standard ones. Each cube is 2X2 inches and, for this reason, it melts quite slowly, keeps your drink cool for a longer time and does not dilute it. Furthermore, you only need one cube in a glass of whiskey and two are more than enough for a soda, juice or lemonade. The trays come in a package of two and are made of silicone which is BPA free. I have not noticed any influence of the silicone on the ice cubes as they do not have any unusual smell or taste. However, the tray is not cut out for water overflow, and you have to fill each square individually. Also, the silicone tray is very wobbly, so it has to be propped from underneath, and carefully transferred into the freezer. Taking the ice cubes out is not easy as well. You either have to leave them to sit and thaw for at least 15 minutes or run the tray under the hot water and then push each ice cube from the bottom. OXO Good Grips No-Spill Ice Cube Tray is made of polyethylene and silicone, neither of which contain BPA. It can produce 14 cubes at the time, and as you get only one tray for the price, it is not as affordable as the trays I have reviewed so far. However, the lid is designed so phenomenally that I would pay double just for the sake of it. After you fill the tray with water, you just swipe across the lid with your hand to get rid of the excess water, and you will get smooth and perfectly even cubes. The half-moon shaped ice cubes are effortlessly released out too - twist it once and press one side of the cube and it will slide out. Another great plus is that the trays stack at any angle which gives you additional options for more storage. I even experimented and turned my tray upside down in the freezer, but the content stayed put. The silicone lid also safeguards the cubes from freezer odors. On the downside, the trays take up more room than standard ones, and the amount of ice I get is barely enough to serve my family some cold drinks. DecoBros King Cube Ice Trays are silicone trays that produce eight extra-large ice cubes at a time. One square can receive almost half a glass of water. I am not sure if the silicone is BPA free as it is not indicated on the package, and I have been unable to find that information online. Unfortunately, there are more negative features I have noticed than the positive ones. Firstly, they do not stack efficiently as they are flat on the bottom and stick to each other. Secondly, there's a powdery residue that forms on the silicon and makes its way into the water - it can be seen in the form of white flakes floating in the melted ice, and it also influences the smell and taste of the ice. Moreover, the issue previously mentioned cannot be resolved as I have tried to clean the silicone with vinegar and use boiled, distilled and even spring water - the result is always the same. For this reason, I would not recommend buying these trays. Komax Plastic Ice Cube Tray is both BPA Free and FDA approved. It is made from high-density polyethylene (HDPE) which seems quite durable. 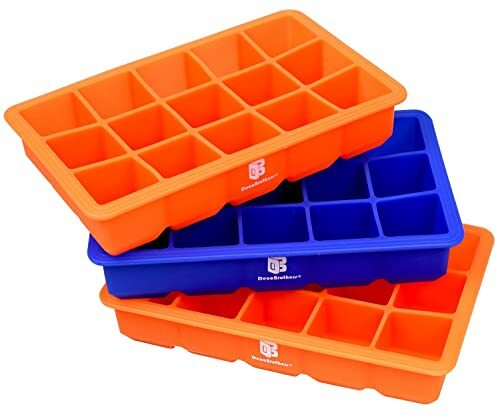 Note that these are wider than regular ice trays but also smaller. The four trays in the package fit twenty-one ice cube each, but the cubes are fairly small too. 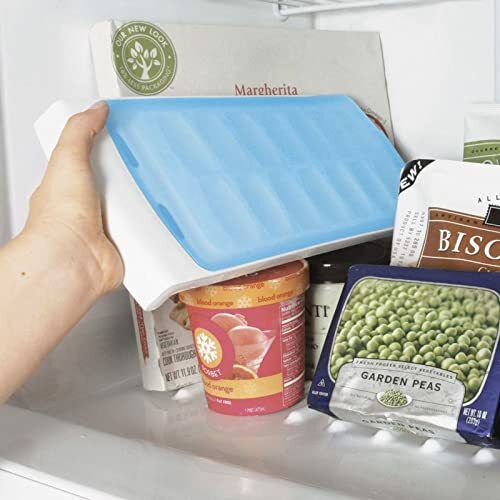 The cover has snap locks on all four sides, and it functions without a flaw; there is no leakage, and it is much easier to transfer the full trays into the freezer. They are also easy to stack, and the cover helps to avoid the absorbing of smells. The only fault is that you must allow for some time before taking the ice cubes out or otherwise it will prove to be quite a task. In order to fill 24oz glass with lots of ice I have had to use almost an entire tray. Luckily, there are four in the package, so there is always enough ice for me, my dear husband and our boys. In the summer party season I will certainly need more than four to keep up, but as they are budget-friendly, that should not be a problem. K﻿omax Ice ﻿﻿Cube﻿﻿ Tray, as it is highly practical and affordable. Moreover, the ice it produces is perfect and has no smell nor taste. In the hope that you have found my review useful, I leave you to enjoy your iced drinks and hot summer days.